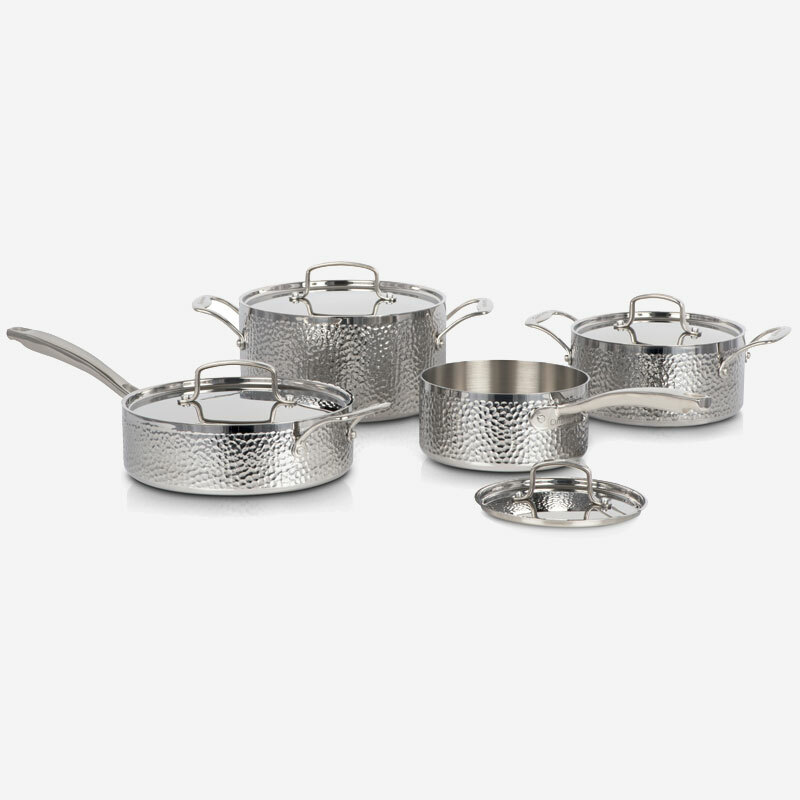 Beautifully designed with a traditional hammered exterior, this tri-ply stainless steel cookware with its pure aluminum core offers unsurpassed durability, quality and results. Heat Surround™ Technology evenly distributes heat along the base and side walls, while riveted handles provide a comfortable grip. Suitable for all stovetops, each piece is induction-ready and oven-safe up to 500°F (260°C). Includes: 2Qt Saucepan with Cover, 3Qt Casserole with Cover, 3.5Qt Sauté pan with Cover + helper and 6Qt Dutch Oven with Cover. Melt the unsalted butter in the 6 Qt. Dutch Oven, on medium-low heat. Add the butternut squash, apple, shallots, garlic, salt, black pepper, nutmeg and continue to cook for 10-minutes, stir frequently. 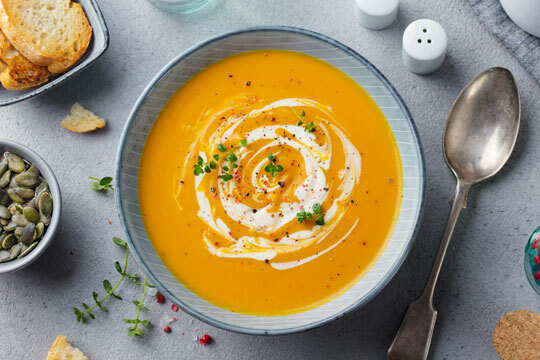 Add vegetable broth and ½ cup olive oil, just enough to cover the butternut squash (if more liquid is required, add water). Increase heat to medium-high and bring the soup to a boil. Reduce heat to low and simmer partially covered for 30-minutes, until butternut squash is tender. Cool slightly and blend using either a blender or food processor. Return to the 6 Qt. Dutch oven and simmer. Add the remaining ½ cup olive oil to the 2 Qt. Sauté Pan, over high heat. Add the sage leaves and fry, until crispy. Remove and place onto a paper towel. Whisk the Greek yogurt into the olive oil until fully combined. Drizzle soup with infused sage-oil yogurt and garnish with sage leaf. 23.75" x 14.50" x 7.50"
24.50" x 15.25" x 8.50"